Lampwick binding on monoline snowshoes. A snowshoe binding designed for traditional winter use differs in many respects from a binding used for technical alpine travel. In general a binding for northern travel should be: lightweight, durable, easy to repair or replace, comfortable and easy to don and doff. Somewhat surprisingly, a complex binding is not required (or desired), perhaps because traditional shoes tend to be well balanced and inherently track well. Below are three types of bindings we regularly use. Pros: Incredibly practical bindings tied from 1″ cord (traditionally hide, now more commonly cotton lamp wicking). These are by far our favourite bindings, offering a very secure fit; hands-free on and off, and are light, simple and economical. Cons: Lampwick bindings will take on water and freeze, but a bit of use softens them right back up. 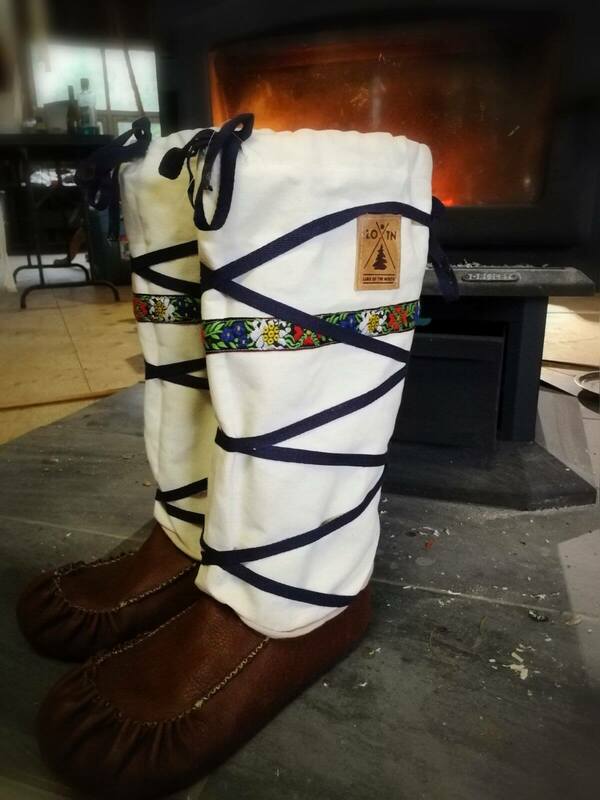 When frozen, lampwick bindings can reduce blood flow to toes more than other styles, fortunately it is easy to twist your foot out of the binding during breaks to warm up. Lampwick needs to be re-tied for different sized footwear, thus are most suited to an individual user. Pros: Our leather bindings are relatively simple and quite durable. They cover a wide surface area, and thus are very comfortable. They are easily adjusted to fit a wide range of different users. Cons: These bindings are heavier and more expensive than lampwick. They do not offer hands-free on and off, and after a serious wetting and re-freeze they can become cumbersome to properly fit to your foot. We carry these on expeditions as an alternative for those participants that have trouble with lampwick bindings. Pros: Rubber bindings are simple, relatively light, and offer easy on and off. They will fit a narrow range of different footwear without any adjustment. 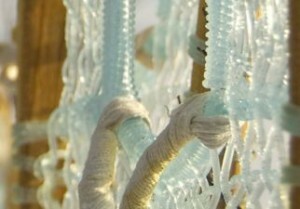 Perhaps most importantly they are completely waterproof, making them a great choice during spring thaw. Cons: Rubber bindings cannot be adjusted. If you are outside the size range of the binding they will require (permanent) modifications to fit. The stretch in these bindings makes them extremely poor climbers, as they do not offer a very secure attachment to the foot. Best suited to more casual use. 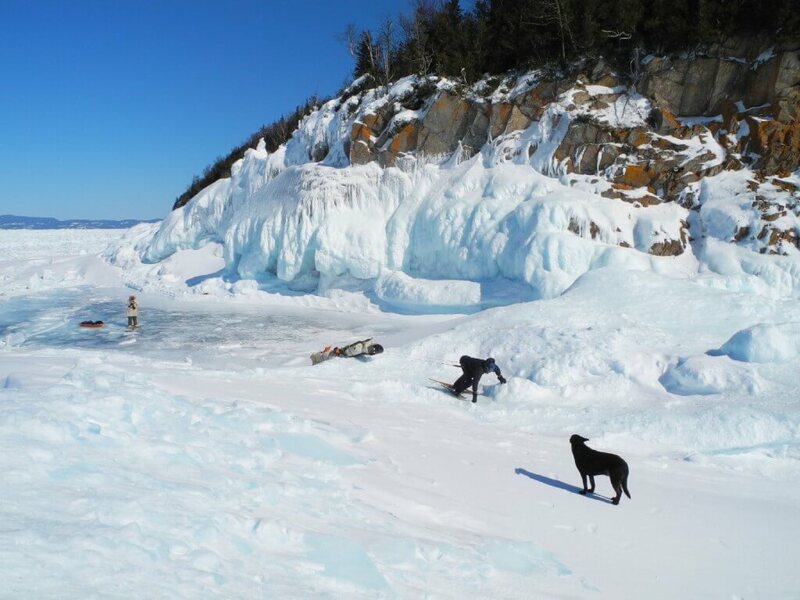 Conor (with lampwick bindings) hauls up a steep pitch of ice on the Lake Superior Coast! Great question – one that we’ve wondered about in the past ourselves. Cotton lampwick works really well, is soft and relatively inexpensive, so we haven’t had much need to try out other materials. Having said that, I don’t see why synthetics wouldn’t also work quite well. In fact, I do believe we’ve used tubular nylon climbing webbing (1″) one time when no lampwick was available. I don’t recall how it performed, which probably means it worked just fine! Try different materials out – its light enough you can always have alternatives in a pack or pocket. Howdy, is it important to use a natural material for the lampwick bindings, or could you use a nylon/poly/acrylic webbing that’s of a similar width and weight? There are some nice soft webs out there that don’t absorb water and it might mitigate the freezing/shrinking issue, but I don’t know if there are other factors that make the lampwick the Most Perfect!